IRGUN = VIOLENT TERRORIST GROUP THAT EVOLVED INTO LIKUD PARTY OF ISRAEL | Concise Politics -- Your Time should NOT be wasted. IRGUN GOAL = ROB ARAB LANDS TO EXPAND BOUNDARIES OF ISRAEL! 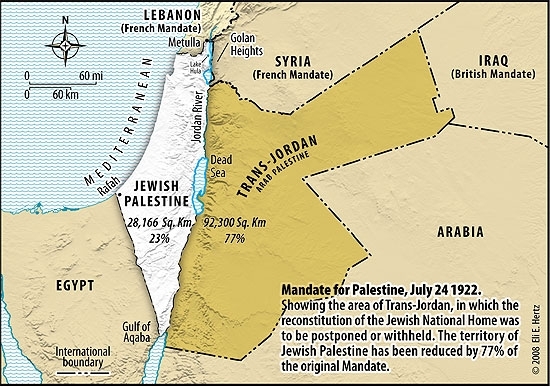 Irgun Map = Shows both Mandatory Palestine and the Emirate of Transjordan = Entirety for a future Jewish state. 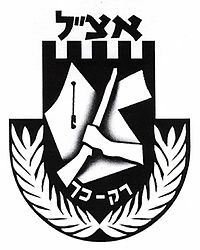 Irgun = Etzel = “The National Military Organization in the Land of Israel” = Zionist paramilitary group that operated in Mandate Palestine between 1931 and 1948. Irgun policy = Revisionist Zionism founded by Ze’ev Jabotinsky based on his teachings: every Jew had the right to enter Palestine; only active retaliation would deter the Arabs; only Jewish armed force would ensure the Jewish state”. Irgun = Bombed King David Hotel in Jerusalem on July 22, 1946 and the Deir Yassin massacre, carried out together with Lehi on 9 April 1948. Irgun’s tactics = Appealed to FAR-RIGHT segment of the Jewish community that believed that any action taken in the cause of the creation of a Jewish state was justified, including terrorism. Irgun = Political predecessor to Israel’s right-wing Herut (or “Freedom”) party, which led to today’s Likud party. Irgun = Seen as irresponsible and needed thwarting. Irgun = USED MASSIVE PROPAGANDA TO SELL ITS EVIL MASS MURDERS TO THE PEOPLE = Numerous advertisements + An underground newspaper (LIKE ADELSON TODAY) + Ran first independent Hebrew radio program (LIKE MICHAEL SAVAGE) and station = FULL OF HATE AND VIOLENCE! This entry was posted in IRGUN = VIOLENT TERRORIST GROUP THAT EVOLVED INTO LIKUD PARTY OF ISRAEL and tagged IRGUN = VIOLENT TERRORIST GROUP THAT EVOLVED INTO LIKUD PARTY OF ISRAEL. Bookmark the permalink.